I’m cleaning my digestive track with salted water. Have you ever done that? dissolve two teaspoons of sea salt in one liter of fresh water and drink it up on a totally empty stomach. Yes, it is as fun as it sounds… when we were passing through Bahía de los Angeles we did it drinking straight from the sea and it was wonderful and horrible at the same time. Effective that’s for sure, it all came out from me in about 20 minutes. Now it’s Costco Sea Salt in filtered water. Tastes better, goes down easier… but I might need to drink two liters and it lacks all the life and nutrients. Also, nothing beats swimming in the paradise of Bahía eating seaweed and drinking Cortez Sea water. So why am I drinking my salted water today? because I ate a LOT of cookies last night. Why did I eat a lot of cookies last night? because I drank a LOT of margaritas last night… and why did I drink a lot of margaritas last night? because I was having a great time with Rossa, our friend from Loreto -another life saving story by the way, that is now in La Paz on vacations. Well, it was three margaritas, not that many, but I’ve been pretty much alcohol free for the past few weeks, except for the second night here in La Paz with Miguel and Niu… that was another margarita night, mhmm. But since the Loreto heat exhaustion episode I’ve been almost alcohol free, so three margaritas is definitely a lot for me. Don’t regret it at all, let me tell you, but now I need to pay the consequences. So far La Paz has been great. It’s been the closest we’ve had to a home-like place since leaving Ensenada and I think we really needed that. We’ve been on the road for one and a half months only, but it required a lot from us. I wasn’t aware of it at the moment, but looking back this ride has already been the hardest most amazing experience in my life. Until now, as I write this words I realize that. I can’t express how amazing Baja California is. It’s magical, intense, silent… magnificent and tough. And it will be, forever, the playground where I learnt to ride my bike. How amazingly hilarious is that! And now in La Paz we get to recover and keep going at the same time. At the moment we’re staying at Glenda’s house, feeling at home. We contacted her through Rossa that keeps rescuing us one way or another. Glenda is so, but so cool. Hooking us up with different organizations here to collaborate with, showing us around town, taking us to the movies! !… the only thing is every day she runs from place to place like the hyperactive person she is, that we haven’t had time to give back as much as I would like, teaching her yoga, giving her craneo-sacral massage or cooking for her and her children. I know this things work themselves out one way or the other, but at the moment we’re getting so much we need to step up… part of being grateful. 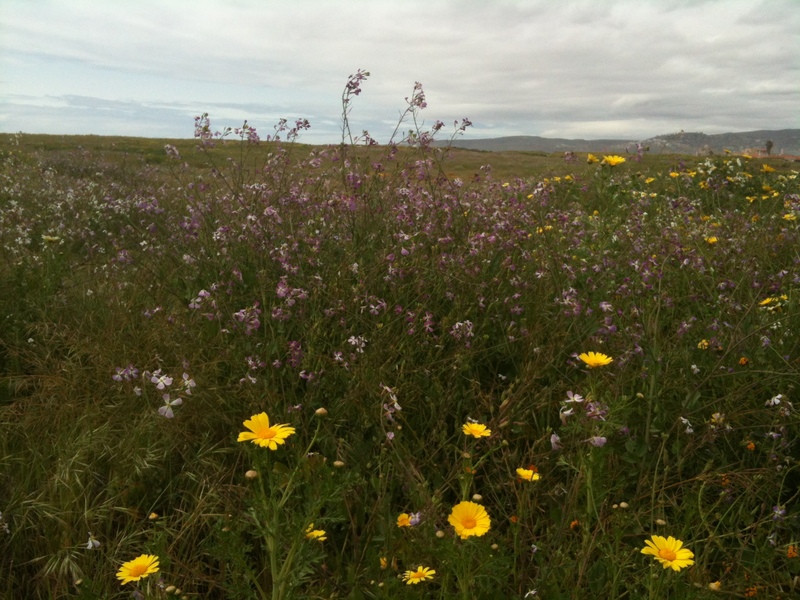 La Lagunita – Spring Flowers – UPDATE!! There are a new residential housing development AND a Salt Water Desalinization plant being built on the Lagoon, the Actual lagoon itself. Next time Ensenada, Try a Little harder if only for YOUR CHILDRENS sake. Aloha, sorry La Lagunita and sorry to the birds that will vanish from our lives and this planet. Recurring smaller clean ups will be held monthly by Pedaling for Peace and Ashtanga Ensenda. Rita and Eduardo Beadle in cooperation with Philanthropiece and Vamos a Limpiar la Ciudad, the objective is to ultimately have the lagoon, which is the only of its kind within Ensenada City and is home to over 140 species of bird of which 17 are on the Endangered Species list, quite simply put, to have it saved simply as it is, well, minus the trash, the southern part of the lagoon is essentially a trash dump, not even kidding, if you had no shoes, walking in from this part which runs along Huerta Calle (Street), would be extremely hazardous as the ground is a veritable minefield of broken glass. You would think it would be obvious, the only section of land in a city which is beyond beautiful, sand beaches, at times full of glass shards, seriously, run barefoot long enough and you will see the point. Bad Joke. Please pick up where you can and please don’t litter in the first place if it can be avoided [if you’re not pathetically lazy]. The more species on the Endangered Species list, merely harkens our own inclusion in the club. News flash, we don’t need that kind of action. Make the change starting with yourself in your own home.